I had to go to Philadelphia for a meeting yesterday. It was an easy day-trip from DC to Philly and back because I took Amtrak. 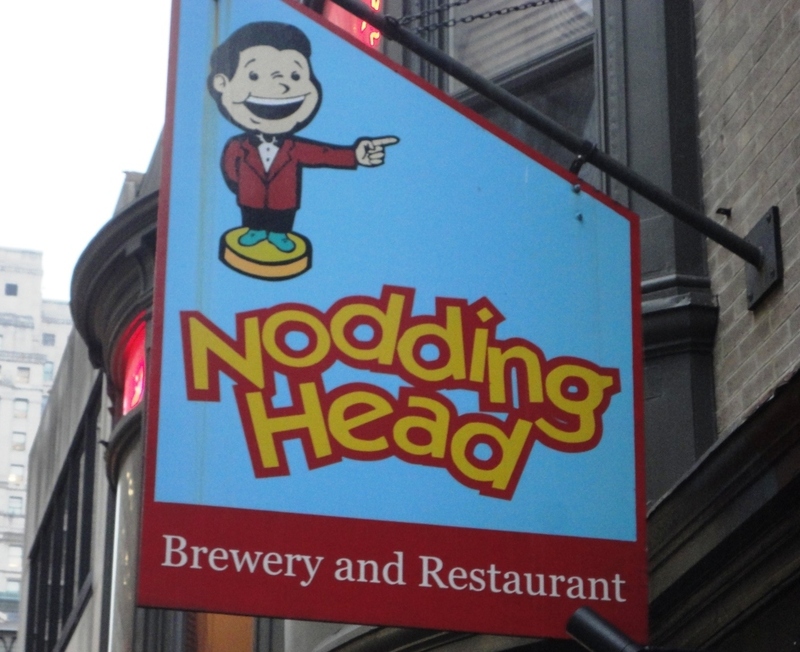 Since I hadn’t been to Philly in a few years, I decided to squeeze in a visit to a downtown brewpub – Nodding Head Brewery and Restaurant, which was only a block from where my meeting was held. My meeting ended at 3:00 p.m. and my train home didn’t leave Philly until 5:00 p.m. – plenty of time to sample some local craft beer. I talked a few work colleagues into having a beer with me, and four of us made the short trek to Nodding Head after the meeting. We arrived to an empty pub – not surprising for a Tuesday afternoon. What we missed in the ambiance of the local crowd was offset by speedy bartender service, since we were the only group in the place. Nodding Head offers one of the most generous beer flights of any brewpub I’ve visited – a 7.5 oz glass of every beer on draft. Most of the flights I’ve ordered at other brewpubs are served in 4 oz or 5 oz glasses. The flight at Nodding Head was so generously poured that there was plenty to share around the table, and we poured smaller samples into the extra glasses brought over by the bartender. I had a train to catch so it was a quick visit, but the brewpub was a great way to relax and unwind after an arduous meeting. We didn’t eat at the pub so on the train ride home I had my traditional Amtrak meal of a hot dog and a beer, and I was traveling in style with a Dogfish Head 90 Minute IPA. It’s pretty cool that they serve Dogfish Head on the train! A day trip and long work meeting in Philadelphia would normally be a real drag. But I can’t complain about a day that included a visit to an out-of-the-way brewpub and a beer from two of my favorite breweries – Allagash and Dogfish Head. 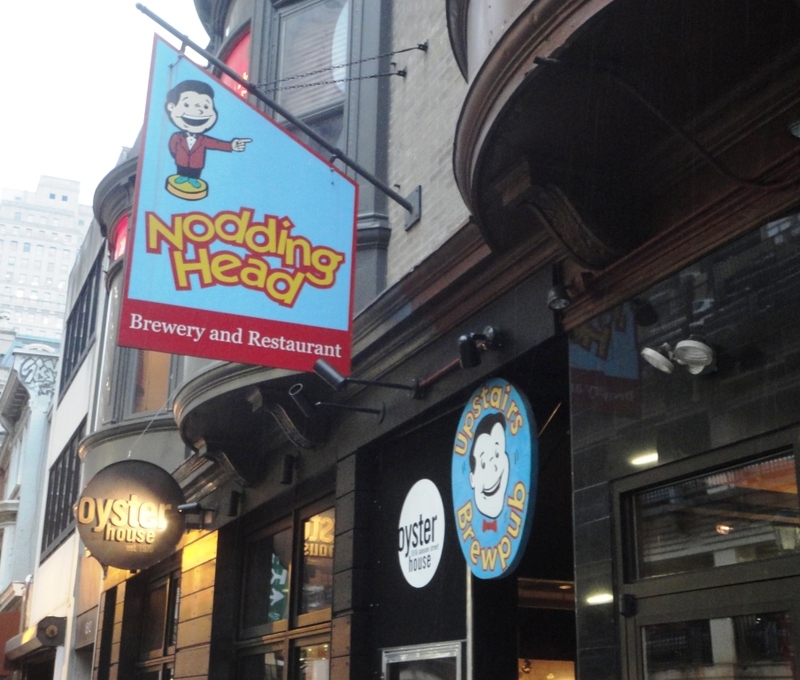 As much as I enjoyed the local Philly brew, my favorite draft at Nodding Head was the guest draft – Allagash White. I’m partial to Maine brew and I’ve visited the Allagash brewery in Portland. Allagash makes some of the best Belgian-style beer outside of Belgium, IMO. Thanks for asking!